Students will experience historically and musically significant sites, perform in stunning cathedrals and churches, and witness the places where some of the most famous classical composers lived, worked, and died. Performance venues include Stephansdom (Vienna), Nikolaikirche (Leipzig), Kaiser Wilhelm Memorial Church (Berlin) and Hedvig Eleonora Church (Stockholm). There will also be visits to Bratislava, Dresden, and Wittenberg included in the itinerary. The tour repertoire centers around the theme “How Can We Keep from Singing?” and includes several favorites that the Gustavus Choir has performed under Aune’s direction over the last 24 years. Aune will retire at the end of this academic year. As a special feature of this tour, an alumni choir will perform alongside the Gustavus Choir for several numbers on the program. This alumni choir is a subsection of a larger group of nearly 50 Gustavus alumni and friends accompanying the choir on tour. In addition to an intensive rehearsal schedule during January Term, students have immersed themselves in a three-week course taught by Cantor of Christ Chapel and Adjunct Assistant Professor of Organ Chad Winterfeldt. The course included an exploration of compositional trends across several musically significant European cities, the intersection of social and cultural developments with music in those areas, and the great performance venues of Europe. 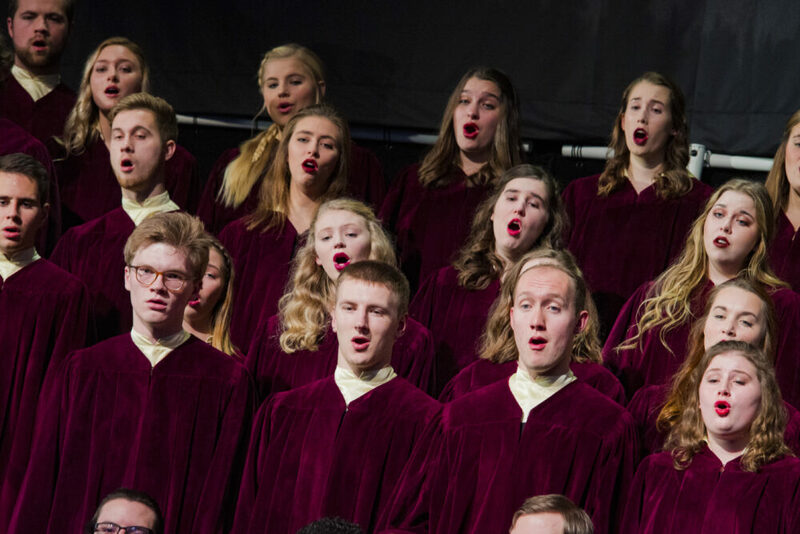 This tour is part of the Gustavus Choir’s extensive annual touring schedule throughout the continental United States with international opportunities every four years. In the past 25 years the Gustavus Choir has appeared at cathedrals, cultural centers, and conservatories in Russia, Estonia, Poland, the Czech Republic, Germany, Sweden, Finland, Portugal, Spain, Japan, China, South Africa, England, Wales, France, and Italy. Throughout the tour check the Ensemble Touring Blog for updates on the choir’s adventures. Upon its return from Europe, the choir will perform a home concert at 7:30 p.m. on Saturday, February 16 in Christ Chapel. This performance is free and open to the public and will also be livestreamed. Thank you for making this comprehensive information available. Being a retired music professor of trumpet and music history and literature [but very active performing yet in the Twin Cities] and the proud grandfather of Sydney Sutherland who will be with the choir on this tour, I fully appreciate the musical and cultural value of this marvelous tour. My wife and I heard the wonderful, inspiring service/concert at Christ Chapel on campus in December and were very impressed with the musical quality and overall performance of the choir and other ensembles. This tour is truly a remarkable musical and educational opportunity for the choir students.